I’m not asking my blog readers to donate money to my March of Dimes walk because I’m assuming most of you who feel inclined to donate have done so on Heather’s page. BUT…I just want to do my part so I’ve put it out there to my friends and family to help me raise some funds. The thing is, my kids are preemies too. I guess I tried my hardest to block out the preemie part of their birth because I was so busy worrying about Sadie being SGA or small for gestational age. But both babes were in the NICU for a month and it was a loooong month. I suppose since most of our challenges have been faced post NICU, I sometimes forget about the preemie part of the equation until I look on my bookshelf and see my Preemies book front and center like other people have What to Expect When You’re Expecting. It’s a book full of scary outcomes and possibilities so I read it as seldom as possible but I have to say I do feel the need to consult it more often than I’d like. I’ve spent more than a fair share of time trying to figure out if Sadie has a syndrome or other disorder that I or my many doctors could have overlooked. I’ve lost a lot of sleep over my kids not just due to normal infancy. I would never ever want to make Heather and Mike’s loss about me. Heather has been a shoulder to lean on, a comrade in small baby land, a procurer of taxis at BlogHer and an overall hilarious and loyal friend and I would do anything to be someone for her to lean on now. At the same time how can her loss not make me think about Sadie who seemed to be on the exact same path as Maddie? Is it a there but for the grace go I? Is it that due to Sadie’s weight gain/developmental competitions with Maddie that I empathize a bit too much? This just hits too close to home for me to not be nudged out of my complacency toward the preemie condition and add my name to those who identify as a parent of a premature baby. So I’m walking. Marching on team Maddie. For Heather, Mike and Maddie. For Alexa, Simone and Ames. For all parents of babies born too early. And for Sadie and Matilda, my own precious preemies. I, too, feel this way. It’s not about me.. but man.. that’s too close to home. It’s just so horrible.. I just can’t stop asking why.. I was extremely lucky to give birth three times to full term, chubby babies. You’re not making this about you; you are reminding us that there are still a lot of premature babies out there, fighting, and there are always more on the way. Thank you for helping us all to find ways to make sure Maddie makes a difference. See, and this was going to be the day I made it through without crying. Damn you. (And thank you). 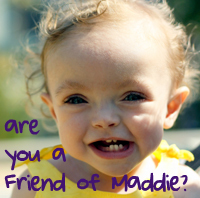 I’m a mom of a preemie, too, and hearing Maddie’s story reminded me that I NEEDED to go sign up for our local walk. So I’m fund raising too, now, and I will walk for Maddie and my Michael, and your daughters, and all the others. I posted about being a preemie mom too, and waffled about doing it cause I didn’t want to exploit it either – but I felt like out experience was too important not to share. I am really sad I can’t lead the Colorado walk on April 25th. I just keep thinking about sweet Maddie and her family over and over and over. And I’ve thought about your two sweet ones this whole time. I can’t help but make this situation about everybody in some way. We are all so vulnerable. I’m glad you’re walking for all the preemies, and especially for yours. Our Publix is doing donations for March of Dimes right now and everytime I buy something I am donating and saying a little prayer. Sadly I’m not sure I would have thought to do that before. I feel very differently now. You know, I went back and read all of Heather’ blog entries in sequence and Maddie was a sick little girl. She had some great days but they were flanked by days before and after of her not being well. It made me realize that her passing was inevitable and thus not unexpected as many have said and that saddened me even more than when I first read the news that she had died. After reading the blog entries over the last 17 months I saw that her death was approaching. This makes it all the more important to donate to the March of Dimes and to other organizations that are conducting research on how to improve the chances for preemies born with weak lungs. I wish I could come walk with everyone. I had my first at 28 weeks. It turned out fine but it was very scary. I was always very aware of the constant danger. Hearing of the Spohr’s loss affects most people that read your blog, I would imagine. As the mother of a 22 month old baby girl it seems especially horrifying. The more levels that you can relate to such a tragedy the more you realize what you say is true. It’s scary and horrible. No parents should have to go through such a thing. My baby was born ‘early’ but didnt have many complications, basically really bad jaundice and a strict warning about flu season. I donated $5 for each week she was born early to the March of Dimes recently. It wasn’t much, but it was what I felt like I could afford, and when we’re settled enough I hope to do a walk. I’ll be walking right along with you on the 25th. I’m lucky enough to have had two full term babies (barely) and I fully realize just how lucky I am. I’m not sure I should even be responding to you, given that your comment makes me want to throw something. But, I’ll try to be as civil as possible. Maddie was a beautiful, perfect little girl, who had lungs that didn’t work as well as yours or mine. She required treatment and care, but NO ONE, NO ONE expected her death on Tuesday. Including her parents, family, friends, and, lest we forget them, her DOCTORS. I understand that you’re probably a thoroughly trained medical professional, and you’re only giving your “expert” opinion. I only wish Heather and Mike could have had Maddie in your care sooner so that you could have told them it was inevitable that their daughter wasn’t going to survive to see 18 months. It would have made all of this so. much. easier. Oh, wait. You’re not a medically professional. And while I can see the point that you’re trying to make, know that you failed. Miserably. I am glad that you can take this horrible substitution and do something positive and good with it. I would be there if I could. I’m on the wrong coast. I too, had preemies in the NICU. My heart breaks for Heather and Mike (and Shana today). My twins daughters were preemies as well. 30 weeks. Neve spent 30 days, Soleil spent 45 days in the NICU. My girls were born 2 days after Maddie so me and Heather shared a kinship of sorts. Maddie’s passing has brought up so many emotions in me as well. I mean, how can I not think about my own girls? Why are myg irls doing well (thank GOD) while others arent so lucky? I feel a mixture of guilt and sadness. Maddie was my daughters’ soul sister. Anonymous, I thought about just deleting your comment which I rarely do because most people who respond anonymously have something worthwhile to say. But you are an example of one who doesn’t. Maddie’s passing was far from inevitable. Have you read any literature on Chronic Lung Disease? Have you had a child affected with premature lungs? Have you researched this topic before going out of your way to make a diagnosis that a woman who lost a child might read? Maddie was under the care of many doctors including a lung specialist. Believe me when I tell you that this was completely unexpected. Maddie was not sickly. Au contraire she was lively and pink and quite full of life. When she came down with a cold it would affect her lungs as would be the case with ANY baby or ADULT for that matter with compromised lungs. I will leave your comment up since people have addressed you already. But in the future, please think before you make ignorant comments even if you did mean well. I have an angel, she was a preme & IUGR. She was 2.5 pounds when she was born. I have an older angel, also a preme, not IUGR, she was 5 pounds. Gigantic compared to the second. I didn't know about Maddie and Heather and Mike until I read about Maddie's death. I slept in their room that night. I listened to their breath — I prayed for Heather and Mike. I prayed for mine to stay healthy and for me to know whatever needs to be known to keep them healthy and safe. I know several moms of little angels that are not here any more… Walk for them, walk for us, walk for Heather and Mike and Maddie & walk for your two angels. Thank you for walking. I just want to say thank you. For walking. For organizing dinners. For being there for Heather the way so many of us wish we could. I’ve been reading your blog for awhile, I have 21 month old twin girls, who were eight weeks premature. I found your blog, and eventually Heather’s, when I was googling “tiny preemie babies.” My Maddie was IUGR when I was pregnant, explaining the preemie birth, and has always struggled to gain weight and has never been on the chart. We have not gone the G-tube route yet, instead stuffing her silly with double stuff oreos. All of that being said, like you, I sometimes forget they are preeemies. I have forgotten the bed rest, the month long NICU stay, and all the fears when they were first born. But now I am reminded of what we went through and in some ways, what we avoided, and am going to register for the March of Dimes walk. Thank you for reminding me. I’m also sorry that this is the first time I’m commenting on your blog. I read it, and find strength in it, particularly your posts on your twins and Sadie’s struggles to gain weight. Please know that although I am quiet on-line, I laugh out loud and cry a lot when I read of some of the similar struggles we are facing here in my home. I still can’t wrap my mind around what happened to Maddie. I am still so sad for Heather and Mike. I will miss seeing that little peanut’s precious smile and her beautiful eyes. When I walk on the 25th, Maddie and all the other little angels that I have come to know through bloggie-land will definitely be in my heart. Thanks to all of you for walking – I was busy hosting my now three year old preemie/IUGR daughter’s birthday party. I wanted to walk, but I also wanted to celebrate the life I have been given to care for, so I just put money on Maddie’s MoD page and painted my toenails purple. And I thank you all again for helping support the other work the MoD does, because my second baby has a wacky metabolic disorder, and the MoD was instrumental in getting more widespread newborn screening on the books in most states, and still has more work to do in that arena. Your financial support helps a lot of families. I have 2 former preemies– a 32 weeker and a 27 weeker. I can't believe they are doing so well now and while we'd love our NICU days to be ancient memories, walking with March for Babies and volunteering for the March of Dimes is like a healing salve for the soul, even though it makes the wounds fresh all over again. I wouldn't trade it, though, because it helps to be sure we never stop being thankful for our treasured blessings and my fully healthy kids. I just found your blog after the Dr. Oz show but had already read your books and LOVED them. But, I think I am experiencing the same thing you have gone through with the nightly drinking and struggling to determine if it's a concern if it's not the "classic signs and symptoms" but the top 3 warnings signs indicate I need to make a hard look and make a change. What I didn't know is that I would find you even more relatable once I read your blog. I read the whole thing and related to having specialists telling me how to help my son grow (he's still just 25 lbs and 3 yrs and 9 months old now) and have obsessed about calories. But when I got to this post, I was absolutely touched. We were the ambassador family in Kansas City for the March of Dimes and it was great to hear your rally support for this amazing organization so close to our hearts.